The Motus adopts the same new frame and Bosch motor system as the Captus with an upgraded 400wh battery which will provide up to an extra 40km from a single charge, meaning that for some riders it could carry them to and from work for whole week before needing charging. The traditional derailleur version of the Motus is equipped with a 10 speed SRAM Via Centro gear system which is perfect if you live in a hilly area as it offers a wider range of gears that go up in small increments; coupled with the powerful Bosch motor this will allow you to climb the most daunting hills and still continue to enjoy the ride. 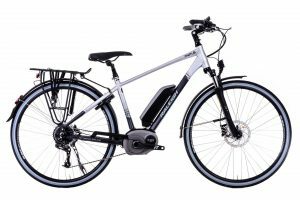 The new generation 2 Bosch Active Line system sees smoother acceleration whilst shifting gear to create the perfect combination of mechanical and electrical pedelec technology. Its optimized 3-sensor concept performs 1,000 highly precise measurements per second, affording optimum power tuning and very low levels of noise & vibration. 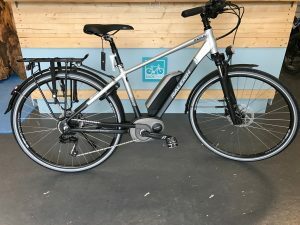 The 400wh battery boasts a range of between 45 and 180km* dependent on the level of assistance selected and can be charged from flat in approximately 3.5 hours meaning you can be back on your bike as quickly as possible. The Intuvia on-board computer allows you to switch between four different levels of support; Eco, Tour, Sport & Turbo, as well as displaying information like speed, battery level, distance travelled and approximate range available. Plus the handy “walk” button delivers a low power output from the motor for those occasions where you need to push your bicycle up some steps or a short slope. The Raleigh Motus comes fully equipped with a kickstand, mudguards and a rear pannier rack. Additional features include high quality lights which are integrated into and powered by the motor system and a clever rear wheel lock which can be quickly applied while you pop into the shops. Braking is covered by new Shimano hydraulic disc brakes, whilst CST e-bike specific tyres keep your wheels firmly planted to the road. The 60mm travel Suntour suspension fork, suspension seatpost, ergonomic grips, adjustable stem and oversize hybrid handlebar all provide the highest levels of comfort over any distance. Plus the Motus is fitted with a high end Selle Royale Scientia R2 saddle for the utmost luxury. If you’re looking for a high quality bike that has the power to let you explore even the most demanding terrain without breaking a sweat then the Motus is the bike for you. The new Motus is available in a choice of traditional derailleur or hub gear system in either a crossbar frame or a low step frame in two colour options as well as a smaller 26″ wheel version with a more compact frame.